This is a short story taken from the epic Mahabharata by Veda Vyasa. Once upon a time there lived a king called Karna. He was famous for his kindness and charity in his Anga kingdom and was popularly known as Daana Karna (Karna the great giver). He has setup a charity bell in his kingdom, people who are in need can ring the bell and get what they need from the king. 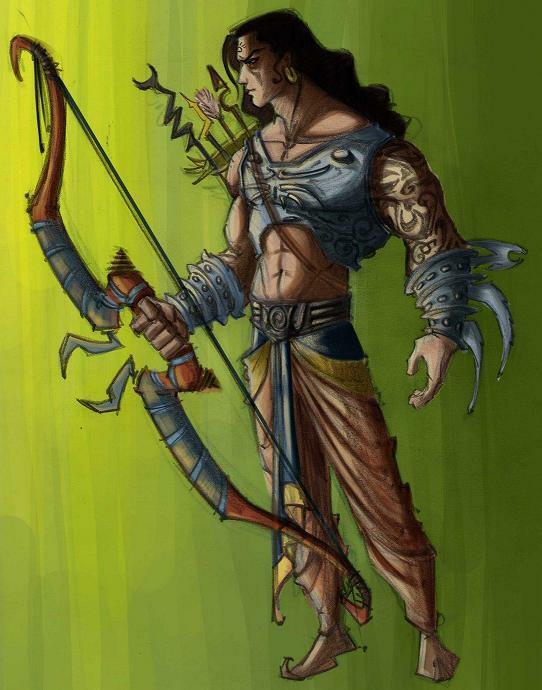 Duryodhana heard about the charity work by King Karna and wanted to try his hand in charity as he was an emperor of the world at that time to prove he is greater than Karna. He too setup a charity bell and started overgenerous charities, thinking himself a great giver. Indra, the lord of the heaven wanted to prove the world who the great giver is. He created continuous heavy rains for about a week. Then he, in the disguise of an old man, went to Duryodhana and requested ten carts full of dry firewood. Duryodhana sent his men to the forest to get the requested, but they could not get any firewood due to the recent heavy rains. Duryodhana pleaded his inability to provide him with the firewood. Then the pseudo old man approached Karna with the same request. Karna also sent his men to the forest to get the firewood for the old man, they too returned unsuccessfully. Then Karna demolished part of his palace to pull out the wooden beams from the roof and fulfilled the wish of the old man by giving him ten carts full of dry firewood. The pseudo old man carried those firewood passing before the gate of Duryodhana's palace. Duryodhana was ashamed and he ordered his men to take off the charity bell as he doesn't deserve to do charity. Thus, the Karna was proved to be the Great giver. This story was narrated by Brahmanda Guruji Shri Narendra Babu Sharmaji in his Bruhat Brahmanda Programme telecasted in Zee Kannada on the day of mitra sapthami.